St. Louis has a very savvy theater community. While we love our standards, we also love to see what else is out there. Co-creators Dave Shirley and Bob Dubac want to take the St. Louis audience on a strange and wonderful trip with their creation, Oddville – A Love Story? 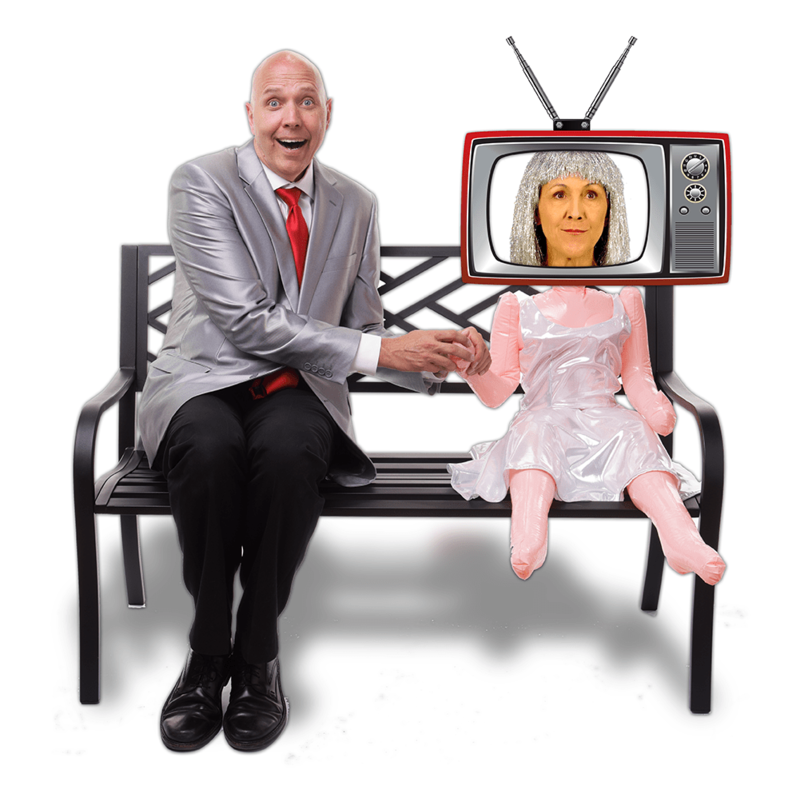 Shirley, a veteran of theatre and TV—he appeared on Season 8 of America’s Got Talent—wants to push the envelope with a non-speaking show utilizing his brilliant manipulation of technology. The show is best described as Blue Man Group meets The 40-Year Old Virgin. That is all I had to hear to be intrigued enough to seek out an interview with the man behind the screen. I got the opportunity to speak to Shirley from his home in Denver. We talked about the uniqueness of Oddville – A Love Story?, his time on AGT, and how technology is helping shape the future of American theatre. Jim Ryan: When Bob Dubac brought his show The Male Intellect – An Oxymoron? to St Louis, I got the chance to interview him. Towards the end of that interview, he mentioned he had this other project he was working on called Oddville. What was the experience of collaborating with Bob like? Dave Shirley: Well, it’s great, actually. I’ve known Bob for several years. I had a theater company in downtown Denver and he was in town doing his show. He came down and introduced himself and gave out some tickets to his show and we became friends. I want to say about three years ago we started collaborating and it’s wonderful. It’s often very challenging to work on projects like this—everybody has a different idea of how things should go. There’s a reason there aren’t a whole lot of people like Bob out there, you know, creating shows. With him, it was just a wonderful experience. We both kind of understood what it takes; that feeling of never giving up; that thing of not settling. We ended up working perfectly together and he’s really the only person I collaborate with these days. When I spoke with Bob, he described Oddville – A Love Story? as kind of a Blue Man Group experience. How would you best describe Oddville? So you have the Blue Man Group side of things, which it’s a very visual show. There’s a big ten foot by ten foot LED wall onstage, so visually, there’s just so much going on—a lot of technology is used. I don’t speak during the show at all. But at its heart, it’s just a love story. It’s the boy meets girl, boy loses girl, boy tries to get girl back story that’s been told in the past, but done in a completely different and unique way. The show has zero dialogue. That has to be a challenge for any actor to be able to convey a message without words. How do you prepare for that kind of role? Well, it sort of actually unveiled itself. This is the first time I’ve ever done a show where I don’t talk. My natural instinct is to go to dialogue. The show was developed originally while I was working out ideas for a one-man variety show. I used to be a street performer. So as a result of being a street performer, you tend to learn a lot of fairly useless skills. I had all of these unusual skills I developed and I thought it would be fun to put them all in one show. I wanted to tell a story with all these unusual ideas, which is what headed me down this route of creating the show as what it is today. It did present some challenges because now it’s all about stage movements and facial expressions. When you take the dialogue out people are more focused on where you are on the stage and how you’re moving and how you’re expressing your emotions. It forces you to pay more attention to those aspects because every little look and movement matters a little bit more in a show of this nature. How seasoned is this show? How many times have you performed it? Well, that’s a good question. How many times have I performed the show? I mean, I haven’t counted so let’s see—probably forty to fifty times. So the show is still learning its path? You know a good friend of mine wrote the book for Legally Blonde: The Musical. When you have Disney behind it, there’s a big team of people helping out. When that show opened, it was ready to go. When I have to create a show without Disney money, it’s a trial and error kind of thing. You got to find the space to do it, then you try it and go back and rewrite and rework things all the time. So I would say that we had to find what the show was supposed to be. We finally settled into it about a year and a half ago. So since then, any performances have just been honing it down to the smallest details. What do you think are the pros versus the cons of presenting a completely new production? Fortunately, Paul at the Playhouse at Westport Plaza is a very experienced producer. And one of the shows that he helped produce many years ago was Blue Man Group. So he’s a guy coming from an experience of people not understanding what Blue Man Group was about. He said those early days were trying to educate people as to what that show was and it took some time for people to understand. Now you don’t have to do that, it’s so well-known people just go to it. But the early days, it was a challenge. How do you communicate that through marketing as to what the show really is? So that’s the con. This show relies heavily on technology. 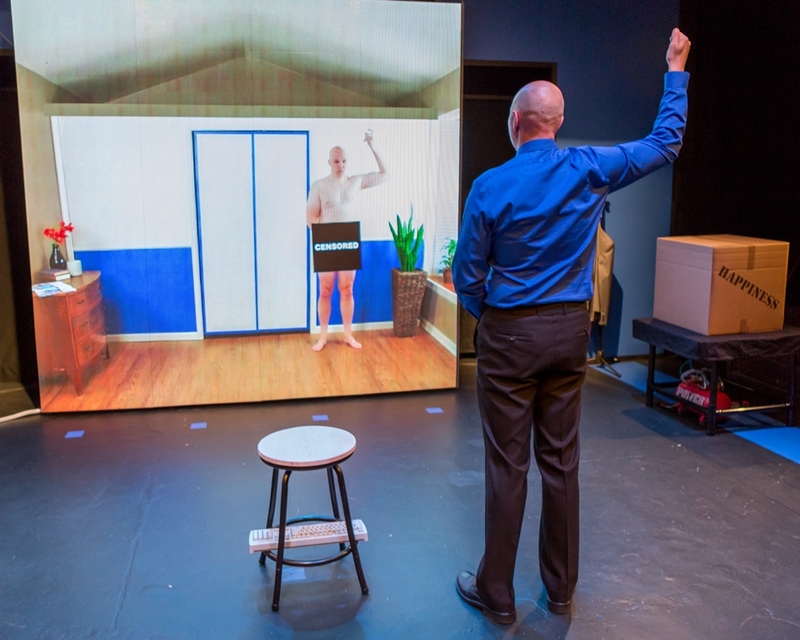 Do you think that is the next wave of American theater—to make it more innovative? You know I think theaters are struggling at times with the technology piece and how to use it. I’ve certainly seen a big push in that direction. The problem is, in my opinion, is that they use technology for the sake of using technology. I think sometimes what happens is if we use technology just for the sake of using it we lose some of the wonderful things about theater. I think that you can look at The Lion King. When The Lion King stage version came out, I was thrilled by it. It’s like they went away from modern technology and instead they pulled in all of those wonderful traditions from Greek theater and the simplicity of how they did those effects in that theatrical environment was excellent. Obviously, I love technology, but the technology in my show is specific to creating the story and the reality we wanted. It’s not there just for the sake of having a big old dumb LED wall on stage. In magic—not that I’m a magician—but in magic, there’s this important element that no magic trick can be too perfect. There needs to be some little flaw in the trick. The minute the magic trick is this perfect illusion with no other possibility other than the guy is a real wizard, it just sort of feels like they used some sort of camera trick and then we blow it off. The fun is to try to understand how it all works and that is always in the back of people’s minds during a magic show. What can happen in theater at times when we rely on technology for the sake of using technology is we start moving closer to getting away from it being a theatrical experience and more towards, “Why don’t we just watch a movie now?” kind of attitude. I think that is the danger sometimes that the giant productions get close to, that they’re so overproduced and perfect and there’s technology everywhere that it makes the audience member feel no longer important to the production. You were in Season 8 of America’s Got Talent. How was that experience? It was a whirlwind of emotions. I sat down and watched Season 7 thinking, “Would this be good for me? Could I be successful on the show?” As I watched it I thought, because of my theater performer background, it would be interesting if I could be the guy who was on the show and every week I did something completely different. If you’re a singer, you are going to sing a song and then next week sing another song—whatever the act is, that is what they are going to do over and over. I thought it would be interesting to be the guy who does one thing and then the next week I would do something else so people have no idea what to expect every week. My only strategy was, “How am I going to stand out from the other 70,000 people that are auditioning?” I thought the video thing would get their attention and I was right. Their first question was, “Can you recreate this so it ties into the show?” I said, “Sure! When I walk onto the screen, I’ll look like Howard Stern and the inflatable doll will turn into Heidi Klum.” So that’s what I did, but it was the same act I’d been doing for years. So they say, “We’re sending you to New York.” and all of a sudden, I’m in the middle of a giant thing happening. When I got out to New York there were thousands of people waiting for the cast members to show up and you’re doing interviews and you come home and your local newspapers are calling you for interviews and they want to put you on the morning show and it’s just, you know, it’s from zero to a hundred—really fast. How did you handle that instant notoriety? So you’re in the middle of it, you’re constantly just keeping up with the whole experience and it’s also important to understand it’s their show, and it is a reality show. Do you have any “behind the scenes” stories you can share? Everyone I met on the show was pretty wonderful. I’m still friends with people I met on the show. My season was the year of the “B-O-O-T-Y” guys. Their goal was to be a one-hit wonder and it was great for them and then they moved on with their lives. The thing that troubled me the most with the whole experience was how it impacted the young kids on the show. When I was on, there was a dance group called the Struck Boyz. They were all around 10-12 years old. For them, all of a sudden, they’re on the show and the same things happening to me are happening to them. They were doing interviews, they were getting filmed, all this stuff going is on and people are cheering for them. They believed this was going to change their lives. They bought into the hype of how they were going to be stars. And it’s just not how it works. You would understand that, I would understand that, but when you’re ten, how do you understand that? They got voted off the same night I did. I was downstairs talking to someone and here come the Struck Boyz with tears in their eyes. It was heartbreaking and I said to them, “Hey you beat out 70,000 other people you came to the live rounds, you need to be proud of what you did.” I don’t know if that helped them at all, but it was heartbreaking to see the end for them. Instant fame is not a new thing, and what I mean by that is when my father, who is 80 years old, was a kid he went to the carnival and paid a nickel to see the bearded lady or to see the goat with two heads. It was the spectacle, but you had to go somewhere and pay a nickel to go inside the tent to see it. We’ve had versions of that for years and years—reality TV is the modern freak show. Now we watch it on YouTube or Netflix or whatever, so it’s the same idea for people who want to watch those things. It has always been there, it’s just delivered differently now. I don’t want to sound like people are getting worse we just have more accessibility to the same idea. Hopefully, people will pay their nickel and come see your freak show—no offense. [laughs] Well, I hope they do. I hope people really want to give it a shot because they’re going to leave feeling like they discovered something really unique. It’s just so different from what out there these days. What’s next for you what do you? What do you have on the horizon? Well, I produce two other shows. I have Oddville which has been an ongoing thing—I’m hoping I can do Oddville for many years to come. I also have a sketch comedy Christmas show that I produce called Santa’s Big Red Sack. It’s the holiday show you shouldn’t take your kids to see—which is the official tagline of the show. It isn’t obscene or anything, but the idea is, I wanted an alternative to A Christmas Carol. When people came to it I didn’t want them to think, “Oh it’s a Christmas show! Load up the kiddies in the car.” It’s not that kind of show—get a babysitter and come out and laugh. This is the ninth year I’ve run it in Denver and it just sells out like crazy. Recently I’ve been talking with other theaters about producing it so I’m working on that, getting it produced in other cities, maybe St. Louis one day. Be sure to catch Oddville – A Love Story? at The Playhouse at Westport Plaza December 27th – 30th. For tickets and show times, please visit www.playhouseatwestport.com.